Having a wonderful car is a dream for every one. One not having a car will always crave for just a single vehicle. But a person having a car will wish for a better one. Putting a side, lets today a talk of drawing a car. In todays video tutorial you will learn in detail about drawing a beautiful car in 3D. 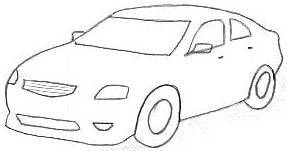 This video tutorial will teach you step by step process for drawing a car. Drawing is skill that can be excel just by doing it again and again. You may tire while drawing, but in the end your success will lick you. So dont give up as it is very hard to draw. But Rockdraw is sharing awesome video tutorial in step wise method. Which can easily be followed even by beginners and kids as well, who don’t even know the basics of drawing anything. So have them in detail and be a master of drawing pets, dogs, cats, realistic cars and every thing you wish for. We are doing our best to present you tutorial from beginning to advance level that teach to draw in 3D.